Wild rice recipes often call for a mix of wild rice and white or brown rice. This recipe as it is written calls for a mix of wild rice and long grain white rice. I love the taste of the two rices mixed together as each has a slightly different texture. Add the rice to boiling water, reduce heat, cover and simmer 15 minutes. Drain and set aside. Heat 3 tablespoons of oil in a saucepan and sauté the carrots, onion and celery over medium heat for about 5 minutes. Add the wild rice, long grain rice and tarragon and mix well. Add 2 2/3 cups water and bring to a boil. Reduce heat, cover and simmer until all liquid is absorbed, about 40 minutes. Meanwhile, heat 2 tablespoons of oil in a skillet. Add the mushrooms and cook, stirring, for about 3 minutes. Add the snow peas, and stir until crisp tender, about 2 minutes longer. Add to the rice mixture. Adjust the seasoning to taste with salt and pepper, and serve. 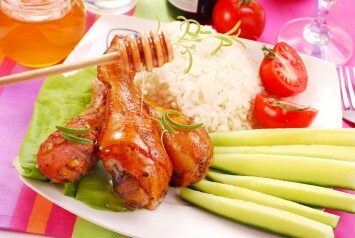 Try the recipe with white or brown rice only. It is just as tasty. I like to add a sprinkling of chopped raw almonds to the finished dish. This is a lovely rice recipe. Wild rice with mushrooms and other vegetables like carrots and celery for lots of flavor. The touch of herb in the dried tarragon rounds out the flavor nicely. If you have fresh tarragon, omit the dried version in the recipe and add the fresh chopped tarragon in the last few minutes of cooking. Fresh herbs are always added at the end of the cooking time, as they lose their flavor if cooked for a long time. Dried herbs on the other hand, are added early as the cooking time helps to release their flavor. Wild rice itself is a very low carb food and perfect for diabetic recipes. This recipe calls for part regular white rice and part wild rice. It’s not a bad recipe for some diabetics, but if your body is more sensitive to carbs, I would suggest making this recipe using all wild rice. It’s a great diabetes diet recipe made that way. 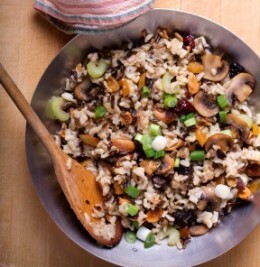 Wild rice recipes are wonderful for entertaining. Look here delicious salmon and seafood recipes to go with this one.